The Nikon Coolpix W300 is a new flagship rugged compact camera with a 16-megapixel sensor, 24-120mm equivalent lens, Wi-Fi, Bluetooth, GPS and 4K video recording capabilities. 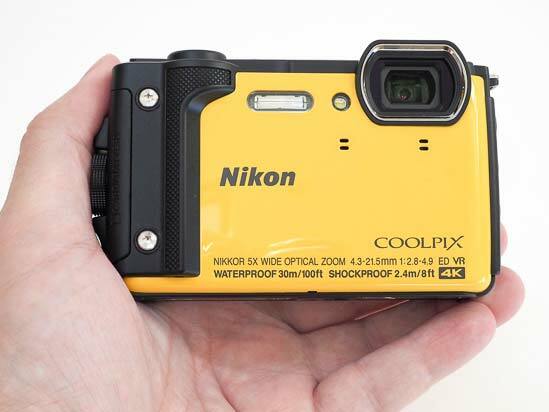 The Coolpix W300 offers a waterproof (100ft. / 30m), freezeproof (14F / -10C), dustproof and enhanced shockproof (7.9ft. / 2.4m) camera body, increased grip area and ergonomically improved shutter button placement. Additional outdoor-friendly features include the ability to go off the beaten path with Points of Interest (POI) and mapping functions, as well as an altimeter and depth gauge, plus a dedicated button to activate an LED light for illumination, and a new Active Guide function to easily display location and altitude data at a glance. 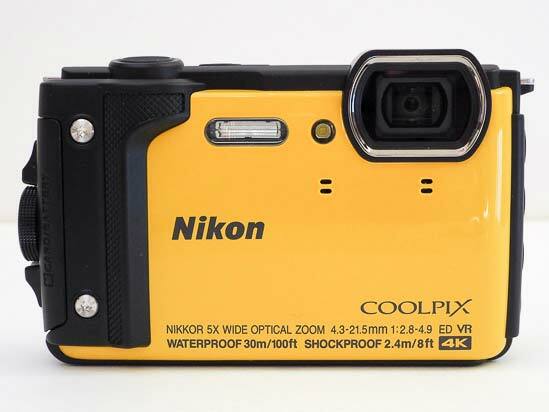 The Nikon Coolpix W300 is available in orange, yellow and black and retails for $389.95 / £389. Nikon has a chunky yet pocket sized new contender for your latest outdoors friendly action camera in the all-weather Nikon Coolpix W300. It’s available in a variety of colours including eye-catching camouflage and the unit we were sent: a hard-to-miss, high-vis jacket-like canary yellow. Measuring an official 11.5x66x29mm, it weighs 231g including battery and memory card, which is lighter than its reassuring metal exterior somehow feels when gripped in the palm. Its manageable size means that it will slip easily into the pocket of a jacket or the pocket of a rucksack, ready to be quickly retrieved when photo or video opportunities present themselves. For a manufacturer’s recommended retail price of £389.99 (which is £20 more than Nikon’s own non rugged but more creatively expansive 60x zoom B700, incidentally), key features of the solid feel, mostly metal constructed camera include the ability to shoot 16 effective megapixel photos, plus 4K or 1080P video at underwater depths of up to 30 metres, or down to temperatures of -10°C on land. That’s without additional housing. 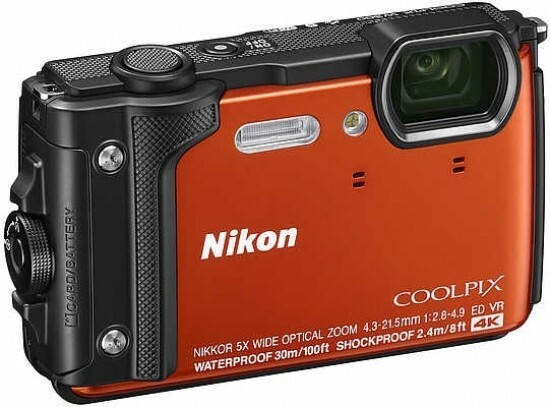 The Nikon Coolpix W300 is also dust proof and drop-proofed from heights of up to 2.4 metres, while it features an internally stacked (and thus protected) wide-angle 5x optical zoom; so far, fairly standard stuff. The maximum lens aperture is a so-so f/2.8 – again par for the course for this ilk of camera. A new Tool button however automatically displays a compass, number of steps taken, plus altitude/depth, along with air pressure/water pressure readings on its monitor, making this one useful as an all-terrain travel camera as well as action camera. Shots can be geo-tagged too. In terms of build quality this Nikon has to be a favourite among recent examples, if we include the likes of the Olympus TG-5 and Ricoh WG-50. For those who grew up in the 1970s and 1980s and remember Tonka toys… well, that’s what this ruggedized camera brings to mind, with its square-ish construction and visible screws embedded in the hand grip at the front. Practicality appears to have taken precedence over fashion, and, given what you might be considering buying this camera for, here that’s no bad thing at all. Indeed the camera very much wears its practically on its sleeve… key spec is printed directly onto its fascia, which is a bold and interesting move as far as stating your credentials goes. Examining the Nikon Coolpix W300, starting at the front, the lens with its internally stacked zoom is positioned top right of the front plate and set back within a protective lens surround. Whilst this keeps it out of potential harm’s way, it also means that a fingertip can occasionally carelessly and casually stray into frame when holding the camera in both hands and lining up a shot; you don’t get the same issue of course when the lens on your camera instead extends outward from the body. Below the W300’s lens we find pin pricks in the face-plate, housing internal stereo microphones, whilst just above is a familiar porthole for the AF assist/ self timer lamp, and next to it a lozenge shaped slot for the integral flash. The latter is at least positioned sufficiently centrally that stray fingertips won’t obscure it. As we mentioned earlier, there is something of a handgrip provided to the front of the camera. However it is fairly slender – being more the sort that enables a couple of fingertips to dig into to get some sort of purchase, rather than fingers to wrap around and envelop. 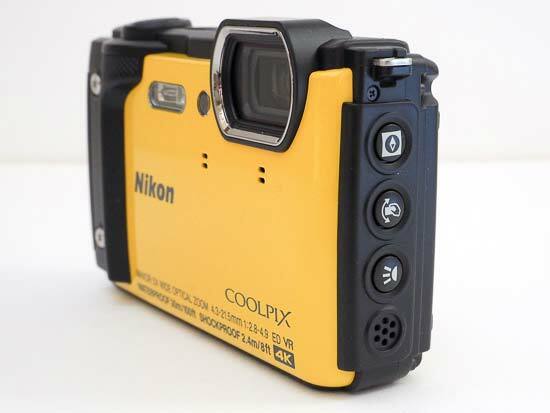 The Nikon Coolpix W300's grip does however cleverly encircle and envelop the side panel and rear plate of the camera, one thereby becoming the other. This same grip/flank also houses the W300’s rechargeable lithium ion battery and vacant SD media card, micro HDMI and micro USB slots. All are protected by a thick, padded lockable door, with a chunky control dial/lever and central release button ensuring that this compartment cannot be accidentally opened underwater, or anywhere for that matter. You have to make a definite press down on the button and subsequent twist on the ridged, roughened feel dial to gain access, much like when altering the drive mode on a DSLR. Moving along to the top plate of the W300, we have a pretty simplified and easy to grasp layout. This comprises just two buttons – a slightly raised shutter release button, which is the larger of the two, while the smaller is labeled as the on/off button for rapid identification. Whilst such implementation means that user are able to pick the camera up and start shooting straightaway, both the surface of the shutter release button and the middle strip of the top plate itself have a roughened surface – presumably to make the camera easier to grasp if handling with wet hands or fingers. The camera is responsive too, powering up from cold in all of a second and the camera determining focus upon a half press of its shutter release button within a further second. That’s as quick as we’d expect of a pocket compact. 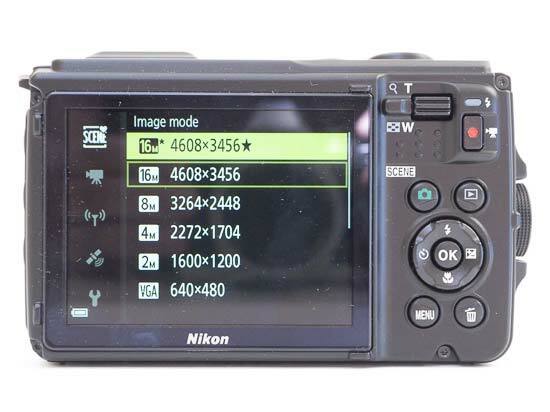 While the Nikon Coolpix W300’s backplate is a little busier, controls are likewise identifiable. With the LCD provided for both the composition and review of stills and videos taking up two thirds of the available space, the controls are ranged over to the right hand third, pretty much like any digital compact of the past 15 or so years. Luckily the view provided by the 3-inch, 921K dot LCD is sufficiently clear to compose shots in a variety of conditions (five levels of brightness adjustment are provided), though naturally it’s difficult to determine whether things are pin sharp without enlarging a portion of a captured image. On this Nikon, operational controls are marginally chunkier than most non-rugged compacts, however, with the camera’s internal zoom controlled via a ridged lever located top right of the rear plate, whereupon it falls readily under the thumb of the right hand. Give this lever a nudge and the zoom travels through the extent of its 5x optical range in all of two seconds. Just to the right of this thumb control is an indicator lamp to inform the user that the internal flash is charged and ready to fire, and below this still is a red record button (for capturing Full HD at up to 60P or 4K videos at up to 30fps) with adjacent video camera icon. The button is set flush with the backplate to avoid accidental activation; it requires a definite press from your thumbnail to get going. Beneath this again is a pair of identically sized buttons – one marked with the familiar camera icon (also written next to it is ‘scene’) on the left, providing on-screen access to shooting modes, and the one on the right most obviously the playback button for review of stills and video. The camera shooting/scene modes are presented to the user on screen only (rather than a dedicated physical dial) via a vertically stacked toolbar on the right of the LCD. Here we get the choice of auto mode, short movie, smart portrait, creative mode, selectable scene mode and auto scene selector – choosing pre-optimised settings based on what the camera itself determines is the best fit for the conditions at the time. The user tabs through these with the aid of the familiar four-way control pad that sits near the bottom of the camera back, with a regular ‘OK’ button at its centre for selecting or implementing features. The selectable pre-optimised scene modes here are Portrait, Landscape, Time Lapse movie, Sports, Night Portrait, Party/indoors, Beach, Snow, Sunset, Dusk/dawn, Night Landscape, Close Up, Food Fireworks, Backlighting, Easy Panorama, Pet Portrait (! ), Multiple exposure, Superlapse movie and underwater. The other settings on the four way control pad encompass flash (settings including auto, auto with red eye reduction, forced flash, off and slow sync), self timer (duration settings of 5 seconds, two seconds or ten seconds), exposure compensation (a modest +/- 2EV) and 1cm macro mode (simply on or off) – again pretty straightforward for anyone or has (or hasn’t) operated a digital point-and-shoot compact before… which in a nutshell is what this is, albeit one with bells on. A self-explanatory menu button and delete button, sitting just beneath the four-way control pad, complete the backplate layout. Press ‘menu’ and we get access to a familiar array of stills and video shooting options, as well as a dedicated Wi-Fi/connectivity mode and, finally, set up. With card and battery accessed via the side of the camera (battery life, incidentally, is officially given as a fairly average 280 shots from a full, charge), the base of the Nikon Coolpix W300 features just a screw thread, set slightly off-centre, for attaching the unit to a tripod – and that’s all. The opposite flank of the W300 to that housing the battery compartment is perhaps the most interesting here – or at least the one that deviates the most from our impression of a standard compact. A press of the top button here – known as the ‘tool’ button - brings up a colourful virtual compass on screen, for those who live to eschew the Sat Nav and go for personal orienteering. Beneath this is the control operated ‘action’ button, which allows, for example, image playback to commence or shooting mode to be selected, merely by shaking the camera – useful if you’re operating it using thick ski gloves perhaps – whilst the third button down is an LED light button, designed to provide extra illumination in dark shooting scenarios, says Nikon. Hold this down for a couple of seconds to activate it, whereby the self timer/AF assist lamp window burns extra bright in retina searing fashion. At the bottom of these buttons is the Nikon’s built in speaker. And that’s pretty much it for the Nikon Coolpix W300. Operation is point and shoot all the way and it’s one of the sturdiest action / travel cameras we’ve come across. But of course we inevitably pay for quality, and the Coolpix W300 is at the top end of what we’d probably be wiling to shell out for a point and shoot camera – even one that is as ‘bullet proof’ as this. Still, if you’re only going to buy one ruggedized camera for using in the pool with the family or on the ski slopes, then we’d recommend the W300 all the way, in terms of construction, response and overall operation.